Key Difference: Samsung announced that it has added a new phone to its lineup that combines the ruggedness of the older Samsung Xcover with the features and oomph of the new Galaxy S4. S4 Active is dust and water-proof. The phone comes with a 5-inch Full HD TFT capacitive touchscreen that differs from the AMOLED used in the S4. The BlackBerry Q10 has a 3.1-inch AMOLED capacitive touchscreen that allows users to access data using touch and weighs approx 139 grams. Below the screen, there is a full QWERTY keyboard that is similar to those found on the old BlackBerrys. The device is powered by 1.5 GHz Cortex-A9 Dual-core TI OMAP 4470 processor and PowerVR SGX544 GPU. Samsung announced that it has added a new phone to its lineup that combines the ruggedness of the older Samsung Xcover with the features and oomph of the new Galaxy S4. S4 Active is dust and water-proof and aims to provide direct competition to the Sony Xperia Z. The phone is aimed at the users that require their phone to be durable as well as provide extra features. According to the CEO and President of IT & Mobile Communications Division at Samsung Electronics, JK Shin, the phone is designed for the people who love the outdoors. 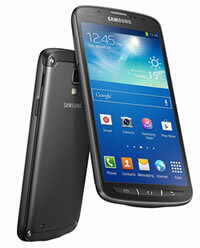 Samsung Galaxy S4 Active shares many features with the S4, but differs in terms of design and aesthetics. The S4 Active is thicker and heavier at 151 grams; the weight is mostly because of the added water and dust proof. The phone has a diamond-pattern textured back that makes it easier to hold the device. The company has also removed the capacitive buttons and replaced them with hardware buttons. The top of the phone houses the 3.5mm headphone jack and has the words waterproof etched next to it. The top also houses the secondary mic and the IR emitter. The volume rocker is on the left side of the phone, while the right side has the power/lock key. The bottom of the phone has the microUSB / MHL 2.0 port that is sealed with a plastic flap. The proximity sensor, light sensor and the IR motion detector are placed on the front above the screen near the speaker. The back of the screen houses the camera and the LED flash. The phone comes with a 5-inch Full HD TFT capacitive touchscreen that differs from the AMOLED used in the S4. It has ~441 ppi pixel density and is protected by corning gorilla glass 3. The phone is powered by 1.9 GHz Krait 300 Quad-core Qualcomm Snapdragon 600, has Adreno 320 GPU and 2GB RAM. The phone comes with Android 4.2.2 Jelly Bean. The TouchWiz UI changes certain Jelly Bean features offering users with more options. The lockscreen features new widgets such as displaying personal messages overlaid on photos from the TripAdvisor. The water ripples effect has been replaced by the lens flare effect, but can be switched or disabled completely. The lockscreen also offers multiple screen on which users can add widget. Another cool feature is the Quick Glance feature that uses a proximity sensor to detect nearby movement and automatically lights up to display time and notifications. The company has replaced the 13 MP camera with an 8MP rear camera that as a capability to work underwater. The volume rocker can be changed into a temporary camera shutter button that allows users to click photos and record videos underwater. The hardware buttons are also provided for the same purpose. The phone offers 16 GB internal storage capacity of which around 11 GB is available to the user. However, the storage can be expanded by 64 GB using a microSD card. The same amazing features that were offered in Galaxy S4 is available in the S4 Active; including gestures, hovering, air wave, smart play, smart scroll and many other fun features. The phone also comes with an Aqua Mode that can be applied to increase visual quality and clarity for enhanced underwater images. The company has also added certain helpful Samsung Apps including Samsung Hub, S Travel (Trip Advisor), S Health and S Translator that can translate as well as pronounce many different kinds of language. The camera also comes with many different features such as Drama Shot, Sound&Shot, Story Album and Group Play. However, it is unsure if the phone offers Dual Shot or Dual recording. The phone also comes with a IR blaster that can covert the phone into a remote. 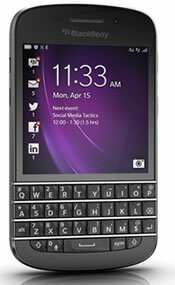 Blackberry added a new phone, Q10, to its growing line-up that is aimed at the original users as it features a full QWERTY keyboard. Separating themselves from the full-touch smartphones, the company is trying to garner attention among the users that do not have time to play with touchscreen and require keyboard for typing. However, fret not; the device is also has touch capability on its screen. The BlackBerry Q10 has a 3.1-inch AMOLED capacitive touchscreen that allows users to access data using touch and weighs approx 139 grams. Below the screen, there is a full QWERTY keyboard that is similar to those found on the old BlackBerrys. The phone has a custom glass-weave black panel that can be popped off to access the battery, SIM and microSD card slots. The USB and the charging port can be found on the left side of the device, while the right side has the volume rocker and a middle button for play/pause and quickly toggling vibration mode. The Power button is placed at the top of the screen, while the mic and the loudspeaker are placed on the bottom of the device. The back of the device has the camera and the flash, which is separated from the removable back by a metal band. The device is powered by 1.5 GHz Cortex-A9 Dual-core TI OMAP 4470 processor and PowerVR SGX544 GPU. The device comes with 2 GB RAM, 16 GB of internal storage system that can be expanded by 64 GB via SD card. The device comes with an 8MP primary camera and a 2MP secondary camera. The primary camera comes with multiple features such as 5-element F2.2 lens, Dedicated ISP (image signal processor) with 64MB frame buffer, Enhanced Super Resolution Digital Zoom (5x), 4 DOF (Degrees of freedom) video stabilization, Hybrid absorptive IR filter and Time Shift. The company has also incorporated the features and apps that are found in the Z10 including The Hub, which is a screen that is available by swiping left after the first menu page and task switcher and it is creates a single point where the user can check all updates from SMS, e-mail to facebook notifications. The phone also comes with Blackberry Balance that allows users to create multiple profiles on their phone separating their professional life from their personal life. Other included features also include LED Indicator, BlackBerry Story Maker, Universal Search, already loaded Blackberry Apps and other apps such as Facebook, Twitter, LinkedIn, etc. The phone houses a 2100 mAH removable battery. The information for the detailed table about the two phones has been taken from Samsung Press website and GSMArena.com.